Each bowl sold contributes to the fight against hunger with a donation to our school's Food To Go program. This program sends food home with students in need before each weekend to assure they have meals while they are not in school. Hunger is real and it is in our community. Help us provide in a simple way to the youth of our community. Cause: Empty Bowls is a ceramic sale of work created by our students and teachers. The proceeds go to our Food to Go program and the Waynesville Art Program. Food to Go places food in the lockers of students in need on Fridays for the week end. This program is one that extends past the walls of our school and provides for our kids even when they are not here! Half of the money earned at our sale will buy food for this. Cost: Bowls will be on sale for $10 & $5 per ceramic bowl. With the purchase of a bowl you can get unlimited soup. If you want to support us but not buy a bowl can buy a styrofoam bowl for $5 and receive the same access to the food. - Donate food for us to serve. Email EMAIL to get on the food list. We ask that your food comes with a serving utensil and both of them be marked with your name. - Sign up to help clean up at the end. With all the food and bowls we would love helpers to wash crockpots and pack up extra food. Email EMAIL if you wish to help with this. -Buy a bowl ! You are involved when you come support our young artists while they work to help their peers! 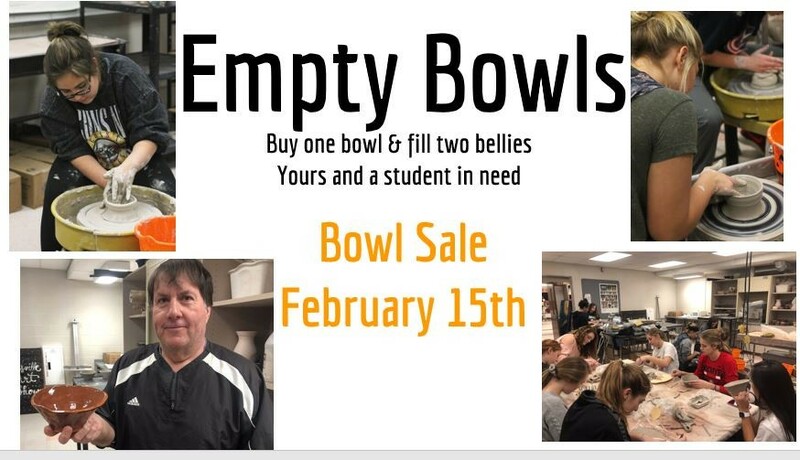 Donations can also be made by bringing it to the high school office at any time and giving to the High School Art Club - Empty Bowls.